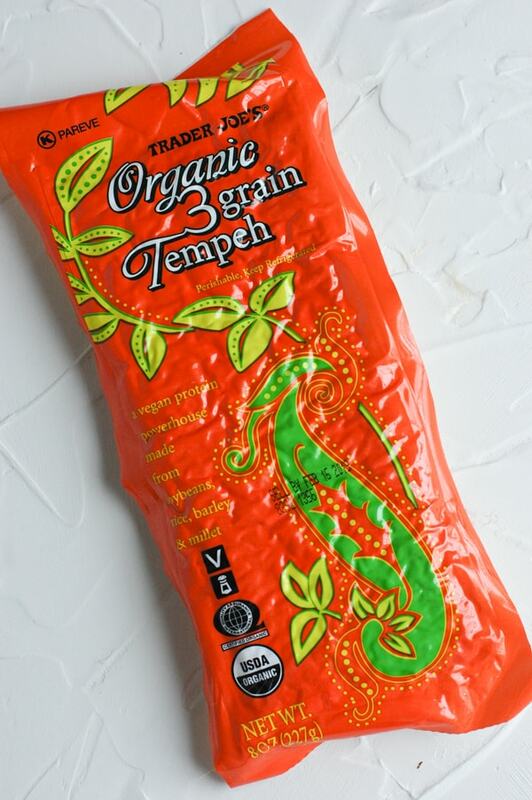 There are so many questions surrounding one of my favorite protein sources, tempeh. What is tempeh? How do you cook it? Is it similar to tofu? Where can I find it? What is the best marinade or sauce for it? This tempeh resource will guide you through all of those questions! 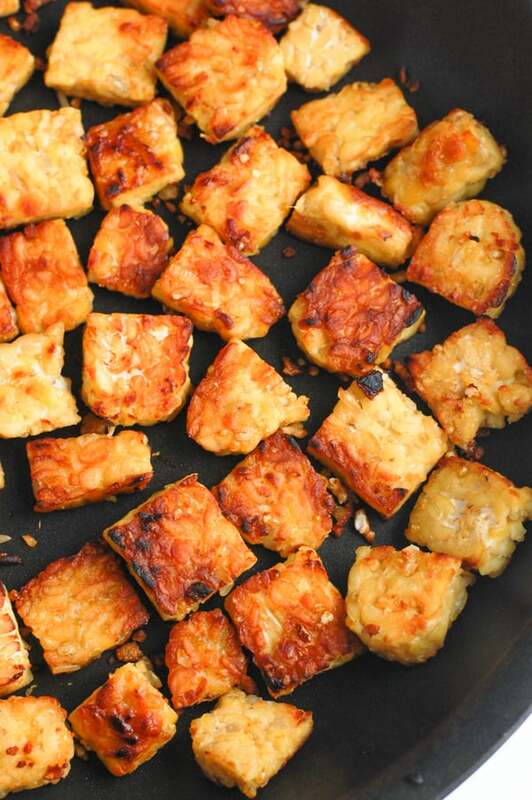 Well, I’m here to answer your questions and provide you with a few tasty and easy ways to cook tempeh. You’ll walk away feeling confident in your cooking of this unique protein source that I don’t think gets nearly enough love! I’m going to be sharing a bunch of tempeh recipes that will make you realize what a versatile protein source it can be. 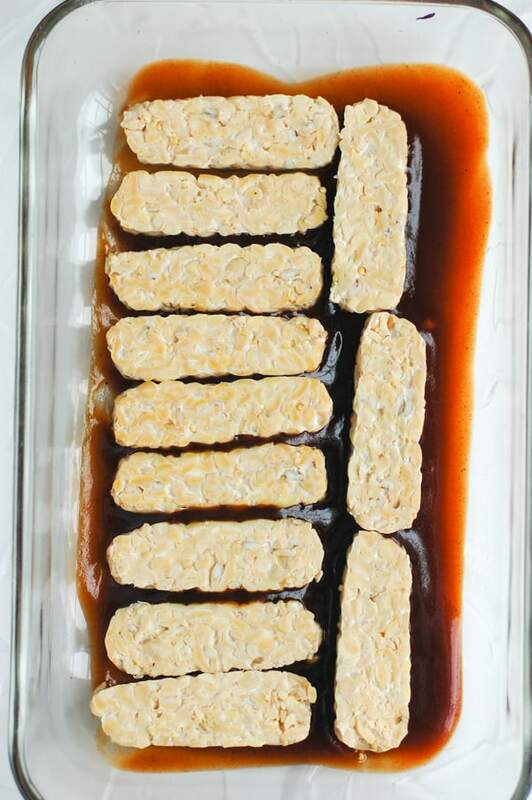 Plus, I will also help show you just how easy tempeh is to make and prepare! 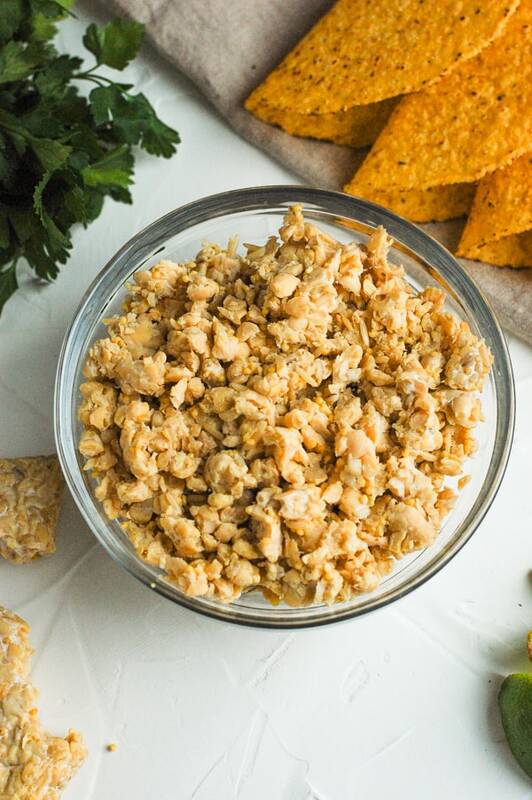 It can be as easy as preparing a marinade, letting it sit, and baking it, to pan frying it with your favorite homemade sauce, to even crumbling into taco meat! Tempeh is a soy-based product, like tofu, however the two have totally different textures and flavors. It is completely vegan! It is made by fermenting soybeans and forming them into a dense loaf. The soybeans are often mixed with small amounts of other grains and legumes to add more texture, like rice and beans. My favorite brand (the one from Trader Joe’s!) is made up of soybeans, millet, barley and brown rice. There are other brands like Lightlife who have a bunch of varieties like three grain, just soybeans and rice, flax, garden veggie, and even tempeh bacon. Taste is a subjective thing, but to me, it tastes nutty and is more flavorful than tofu. Part of the reason why I prefer tempeh to tofu is that it actually holds up sauces and marinades really nicely, and it has an incredible texture that tofu is lacking. You can cut it into strips, into cubes, or even triangles, but I prefer as small as possible to get the most amount of marinade all around the grooves. What are the nutritional facts of it? The recommended serving size is 1/2 of a package and it comes in at 240 calories per serving. There are also 20 grams of protein and 9 grams of fiber. Each brand has their own nutritional information based on what else is in it. 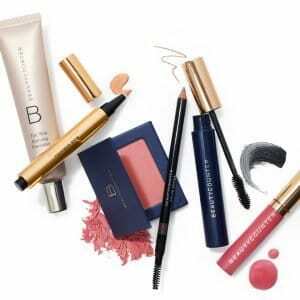 It also contains tons of vitamins and minerals and is generally low in fat. Where do you buy tempeh? You can buy it in most grocery stores. As mentioned above, I love to get mine at Trader Joe’s because the entire block is only $1.99 – yes, it is that cheap!!! It is a refrigerated product. I typically find mine near the refrigerated goods in the produce section. At my current grocery store, it is near the tofu. Just ask where the tofu is and it’ll be next to that! How do you cook tempeh? There are so many ways to enjoy it! But there is a key first step that you need to do before you do any type of preparing: steaming. 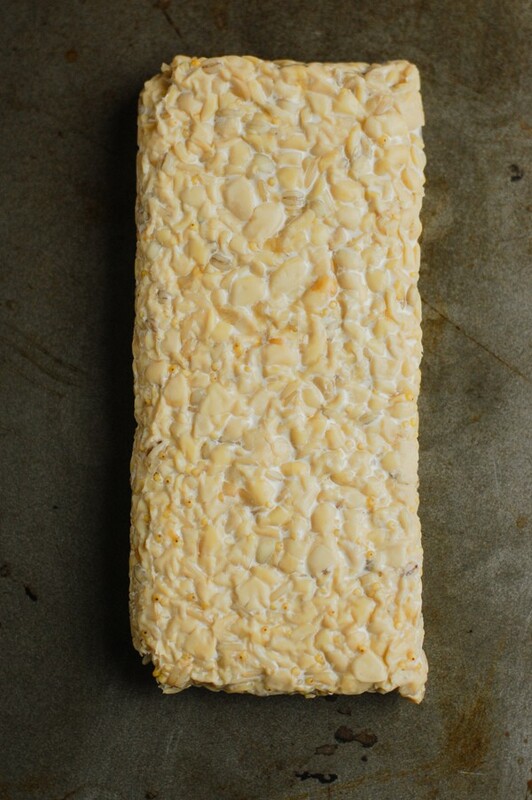 Some people think tempeh is slightly bitter on its own, so there is a way to avoid this by steaming it for about ten minutes ahead of time to remove the bitterness. It also helps to allow the tempeh to absorb any of sauces better because it is almost like ‘opening up it’s pores’ aka making more room for sauce to go in. If you do not have a steamer, fear not! 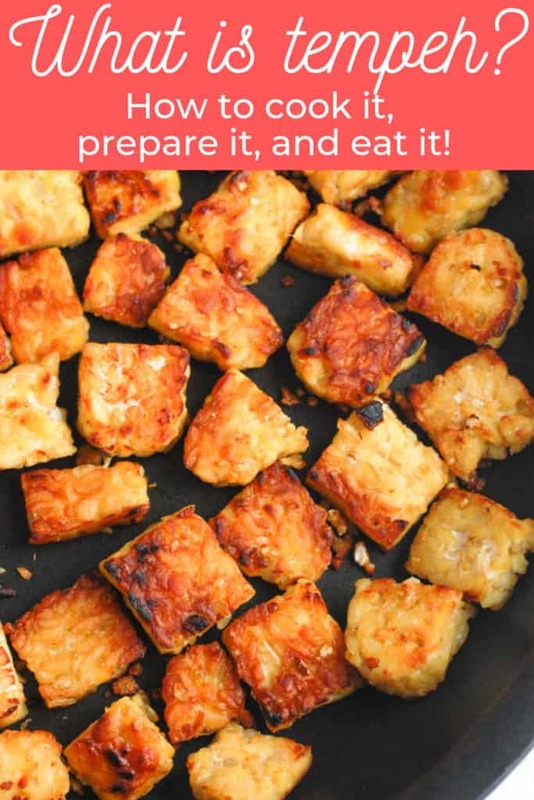 This can easily be done by bringing 1 cup of water to a boil in a pan, adding the tempeh, placing a lid on top, steaming for ten minutes, and your done! The tempeh is then ready to be prepared in any way you want. You can slice it into any shape you want: strips, cubes, triangles, in half, etc. and then cook it in several different ways. Some of my favorite ways to prepare it are to pan-fry it and to bake it. Next up on my list is to air-fry it! One of my first ever favorite recipes for tempeh was making it into a stir-fry with an Asian sauce, but I also love to make it into tacos too.